Like my Donna Karan x Liberty shirt you saw earlier this week, this dress is another departure from my comfort zone. 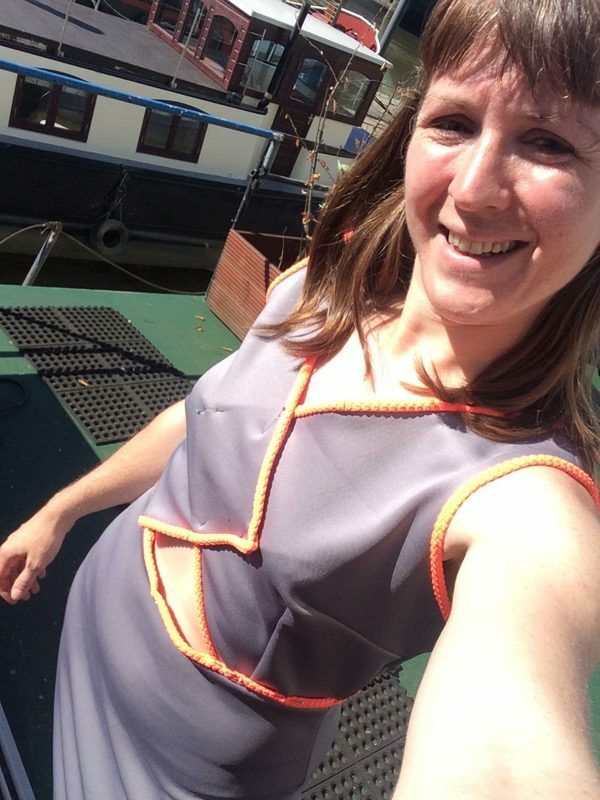 Yes, it's made in stretchy scuba and in decidedly "me" colours, but it's drafted from my measurements instead of a pattern and you can see my midriff! This all began when I went to the launch party for the DIY Couture No Patterns Needed book back in July. The party itself was a total blast - it was basically a Who's Who of the London sewing scene and I got to see loads of people I'd not seen in years, as well as meet plenty of new friends too, in addition to seeing a lot of the models from the book wearing the different designs. I bought the book on the night (and got it signed!) but I wanted to hold off talking about it here until I'd had a chance to actually make something from it. Now, if you're expecting an unbiased review, you're going to have to go elsewhere - Rosie is a good friend, having bonded not just over sewing but cycling, London, helping people, teaching, generally having a good ol' rant while we worked together behind the scenes on GBSB season 3. This is her second book, and I personally know how hard she's worked on this, slaving over it even on the hottest summer days, for like two years now! She's truly a one-woman show, devising all the designs, working out the maths so they fit any body shape, and doing all the illustrations and samples herself, too. Like my Donna Karan x Liberty shirt you saw earlier this week, this dress is another departure from my comfort zone. Yes, it’s made in stretchy scuba and in decidedly “me” colours, but it’s drafted from my measurements instead of a pattern and you can see my midriff! 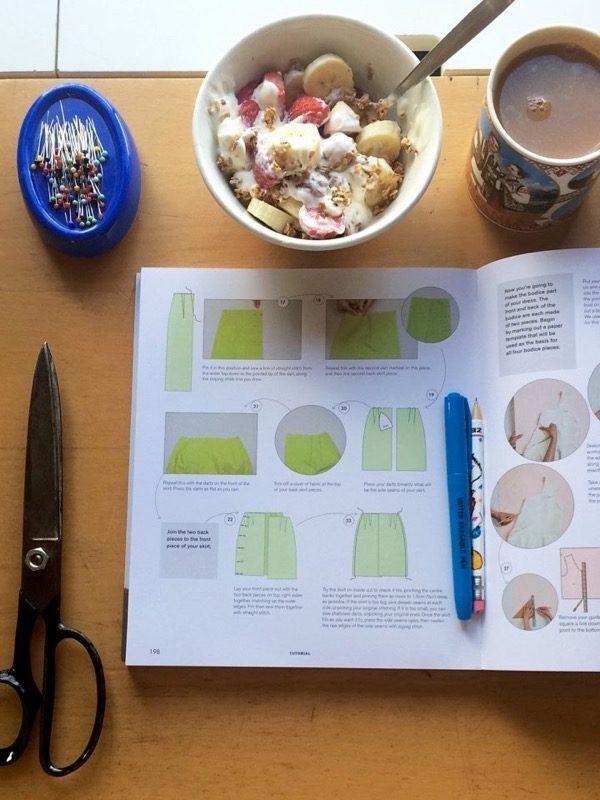 This all began when I went to the launch party for the DIY Couture No Patterns Needed book back in July. The party itself was a total blast – it was basically a Who’s Who of the London sewing scene and I got to see loads of people I’d not seen in years, as well as meet plenty of new friends too, in addition to seeing a lot of the models from the book wearing the different designs. I bought the book on the night (and got it signed!) but I wanted to hold off talking about it here until I’d had a chance to actually make something from it. 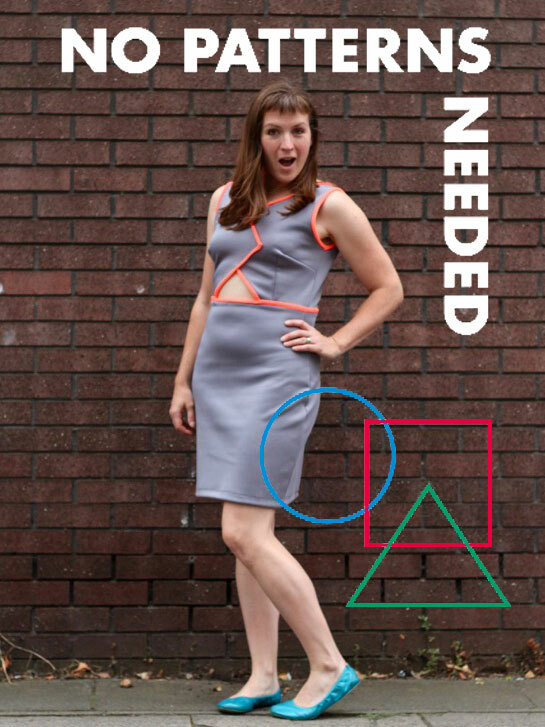 Now, if you’re expecting an unbiased review, you’re going to have to go elsewhere – Rosie is a good friend, having bonded not just over sewing but cycling, London, helping people, teaching, generally having a good ol’ rant while we worked together behind the scenes on GBSB season 3. This is her second book, and I personally know how hard she’s worked on this, slaving over it even on the hottest summer days, for like two years now! She’s truly a one-woman show, devising all the designs, working out the maths so they fit any body shape, and doing all the illustrations and samples herself, too. My first flip through the book was on the tube ride home from the party (I feel like I was restrained in even waiting that long!) 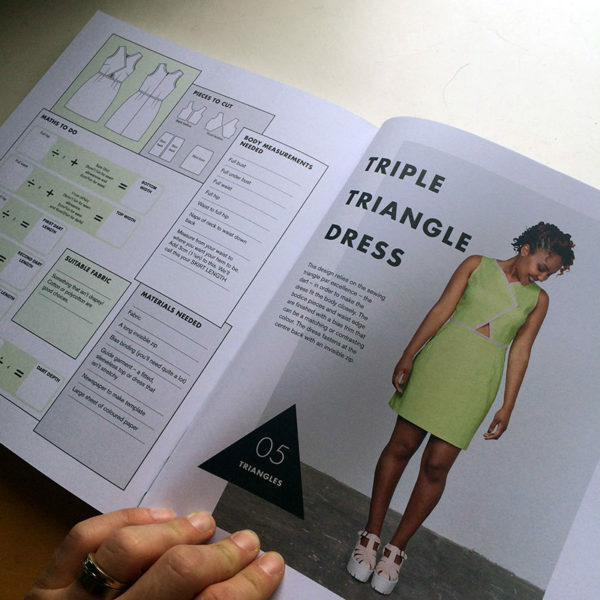 and while lots of designs jumped out at me, I fell hard for the last one in the book, the Triple Triangle Dress. This particular design is meant to be for wovens, with a darted skirt, sleeveless bodice with crossover triangles and midriff opening, bias-taped edges, and centre back invisible zipper. But that sounded way too easy, and I enjoy wearing stretch fabrics more than wovens, so I decided to crack on anyway and make it my own – made much easier when you’re in control of the pattern! So I sat down with a big ol’ sheet of paper, a pencil, and the bodice from a dress that fit well, and followed the instructions, deviating here and there where I knew I’d need to change it for my stretch fabrics. If you feel intimidated by the prospect of drafting your own dress or top, honestly, don’t be – the drafting was a piece of piss, honest! The instructions and illustrations are fabulous and I swear I didn’t even have to concentrate too hard! I did my own binding with strips of the neon pique (watch the little 10 second video here). Since both fabrics were quite thick, I didn’t do a traditional two-fold binding, but instead I overlocked it on, right sides together, then flipped it round to the back and stitched in the ditch to secure it. FOE would also work though, just remember to remove seam allowances from those edges first! 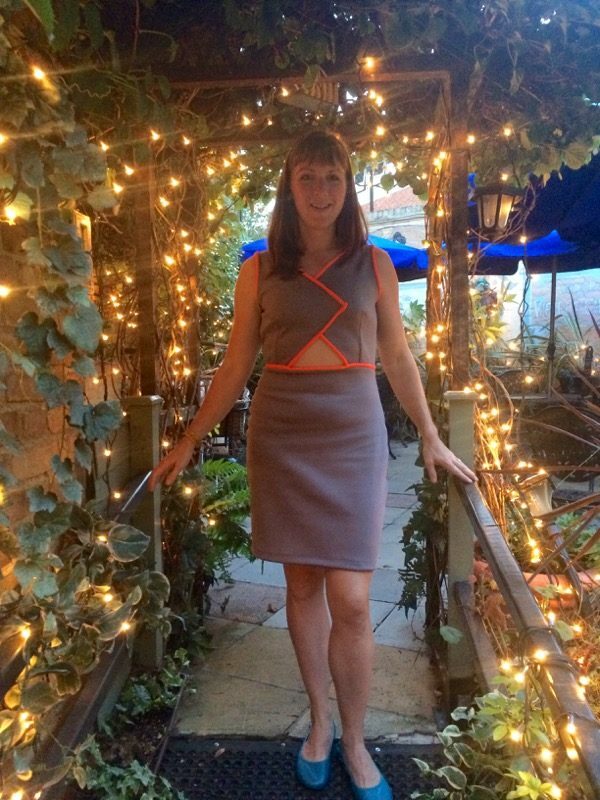 I made this dress in a single day (including the drafting! ), and even wore it out to dinner that night to a little French bistro we discovered around the corner from home. It happened to have a magical little garden patio all lit up with fairy lights that I couldn’t resist using for photos! 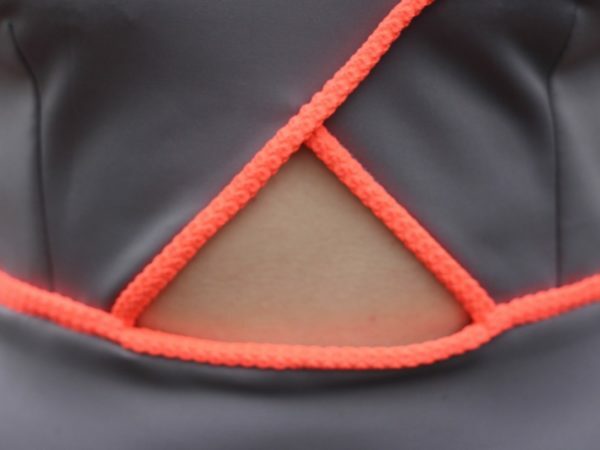 The only issue with using the neon pique for binding, though, was that it was so thick and textured that the under layer was creating visible lumps from the right side. The last step in making the dress is to stitch along the top side triangle’s binding to permanently attach it to the inner layer, so after realising that there was no need for the inner triangle and lumpy binding to be there, I just chopped it off, and voila, no more lumps! I think most women have a part of their body that they’re not comfortable baring. Me, I’m fine with low-cut tops and thigh-high skirts, but ask me to show the tiniest bit of midriff and I run a mile. So I went out on a limb in making this dress and for me, this is definitely dressing outside my comfort zone! And as if this isn’t enough – I made a matching crop top from what was left of the 1 metre of neon pique I bought, too! How thrifty! You’ll see that, both paired with this dress and on its own, later this week! Separator image Posted in Gallery and tagged with diy-couture, dress, knit. Great photo shoot for a great dress! The pique looks like the underside of octopus tentacles 😀 Fun dress!